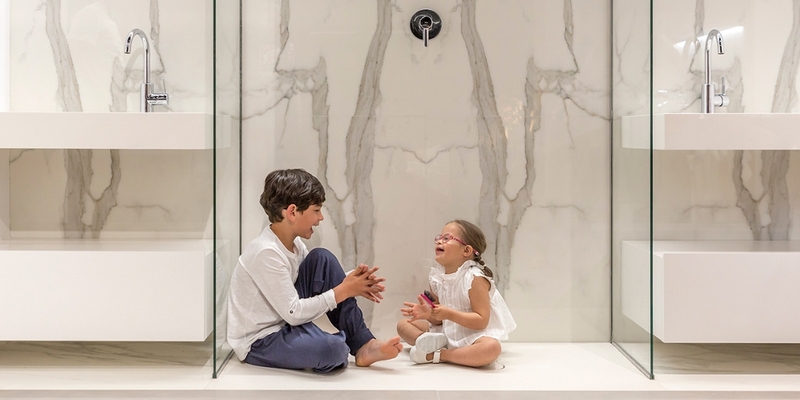 NEOLITH®, has announced a campaign partnership with the National Down Syndrome Society (NDSS), the leading human rights organization based in the United States of America, for all individuals with Down syndrome. 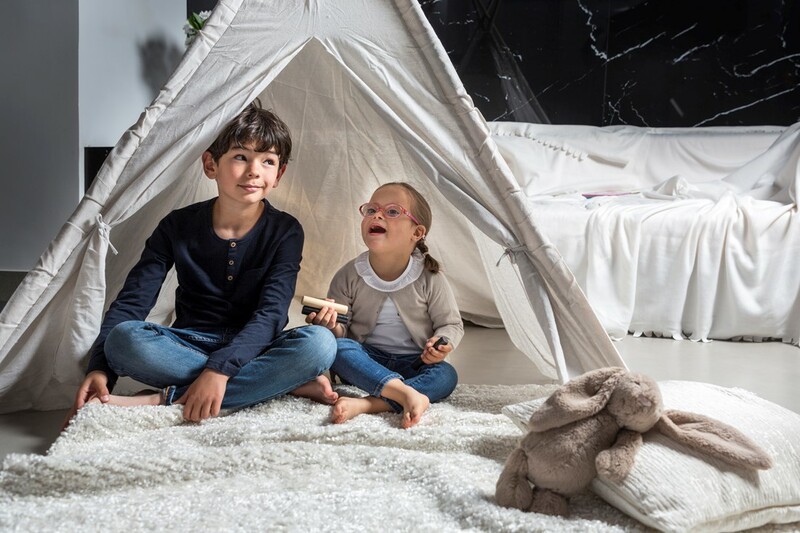 By combining forces, NEOLITH® and NDSS aim to promote awareness and contribute to the social integration of people with Down syndrome through NEOLITH®’s brand ambassador, three-year-old Pepita Sierra, better known as @Pepitamola on Instagram. Pepita Sierra, better known as @Pepitamola on her Instagram account, is a little girl who has already won over more than 200,000 followers in her short life of three years. When Pepita’s mother, Fabiola Arroyo Ozores, decided to open this account, she had no idea what a social impact each one of her publications narrating the day-to-day of a little girl with Down’s Syndrome would have. It’s that extra chromosome that makes them all so special and truly extraordinary. It’s that extra courage, affection and tenacity her parents found themselves with, but also extra happiness: the happiness Pepita offers all of her family and all those who are lucky enough to be a part of her extraordinary life. “I decided to create the account to spread social awareness and normalize Down’s Syndrome. I want everyone to see how normal her life is, how she’s just another sibling in the family and a happy little girl,” says Fabiola. When NEOLITH® discovered Pepita, it was love at first sight. After all, Pepita is living proof of many of the values that define the company: family, humility, originality, perseverance, optimism and that tireless spirit to improve and continuously do better, celebrating “small – major” achievements day after day. Paying homage to Pepita, her mother and all the brave people out there who face life’s challenges with positivity, passion and determination. Highlighting people who grow despite adversity, stand up stronger each time they fall and take the world by storm. Doing our own bit to spread awareness and contribute to the social integration of people with Down’s Syndrome, breaking down all the stigma around them. Pepita is a happy girl who captivates everyone who crosses her path with her charm and charisma. What’s more, the Castellón-based company will donate a portion of its profits at the end of the year to the Pepitamola foundation, the primary aim of which is precisely to fight for the normalization and integration of people with different and extraordinary abilities like Pepita. Showcasing its extraordinary surfaces, which combine beauty and resistance (just like Pepita!) in different residential atmospheres where extraordinary moments happen day after day. Authentic, exciting, fun, memorable and relaxed moments around a lovely kitchen, dining room, bathtub, playroom or living room. In any good children’s bathroom, which at times become improvised play areas, all the bathing elements must be durable, functional and low-maintenance. And when it comes to a bathroom for the whole family, the choice of materials used is essential to creating refreshing spaces with a beautiful look. Resistant to liquids, stains and scratches, NEOLITH® combines beauty and resistance in the bathroom as well. Its versatility multiplies the possibilities for its use as different solutions can be blended in a single atmosphere. From shower walls to bathtubs with interesting contrasts in the tones of the floors and walls, to countertops and bathroom furniture offering uniformity, continuity and balance, all without compromising the integrity of the surface. In these pictures, Pepita shows just how happy and cute she is with the smile she’s known for and getting on naturally in that area of the home where we all begin and end each day. They’re extraordinary moments that turn into relaxing and even fun experiences with someone like her, and an extraordinary surface like NEOLITH®. The living room is the heart of a home, one of the rooms in the house where we spend most of our time as a family – resting, reading, celebrating or enjoying a bit of relaxation. It’s a family area where we also receive visitors and where functionality and design must go hand-in-hand because it can become a play place for the youngest in the house at any time. It’s in the living room where Pepita enjoys herself the most, playing and being creative, and where she puts the floor resistance to test as she slides all her toys across it and, sometimes, that very same NEOLITH® surface even becomes a canvas for her best portraits. Fun and games assured thanks to long-lasting scratch and stain resistant materials that are easy to clean like NEOLITH®, which also shines and combines with the rest of the rooms in the house given the extensive variety of colors and finishes. 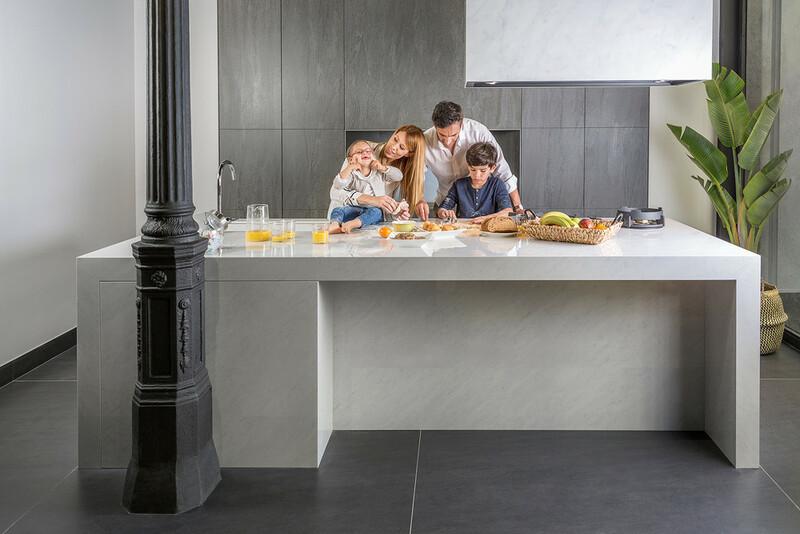 The versatility of NEOLITH® means it can be used for other applications in the living room like wall paneling, fireplaces or in furniture to create a comfortable and safe environment for kids and adults alike without giving up on a great look. Extraordinary material suitable for any room, application or family.